Mistletoe, Tinsel & Jingles [E6532] - $10.00 : Yarn Tree, Your wholesale source for cross stitch supplies. Cross stitch chart from Heartstring Samplery. Christmas wishes & mistletoe kisses. The ribbons, the wrapping, the tags & the tinsel! Get your jingle on, it's Christmas! The first design features "Mistletoe" with mistletoe stitched around the word. 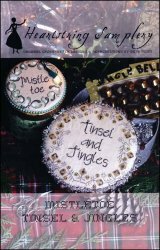 Tinsel & bells are stitched around the saying, "Tinsel and Jingles." Stitch count is 89 x 89. Stitched on #2330 R&R Reproductions 40ct. Patriot's Brew. Orange Clementine Aida 18ct Short Cut 8" x 43"